However, latest research published by Paul Thomas in Policy & Politics, Professor of Youth and Policy at the University of Huddersfield, shows that such criticisms failed to grasp the significant adaptation and resulting positive outcomes of Prevent over the course of its implementation which have largely been ignored in media reporting. In particular, there has been a shift away from responsibility to prevent terrorism being placed on British Muslim communities, instead placing it with front-line public servants. Thomas explains how people at ground-level modify policies as they implement, so developing policy that looks significantly different than national debate would lead us to believe. For example, he cites recent research showing that education staff in schools and colleges are more positive about Prevent than expected and describes how their ongoing modifications of it are securing more positive outcomes. In summary, while acknowledging that Prevent is ‘complexly ‘flawed’, Thomas casts new light on the positive contribution it has made which has gone unreported previously. Paul Thomas is a Professor of Youth and Policy and Director of Research for the School of Education and Professional Development at the University of Huddersfield. 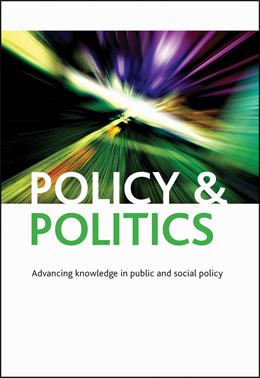 This post was originally published on the Policy & Politics journal blog on 5 July 2017. Thomas, Paul (2017) ‘Changing experiences of responsibilisation and contestation within counter-terrorism policies: the British Prevent experience‘, Policy & Politics, 45(3): 305-321. If you enjoyed reading this blog post, you may also be interested in attending the Policy & Politics Annual Lecture 2019 with Baroness Sayeeda Warsi on Muslim Britain. Who are British Muslims? Why have they become singled out as ‘other’? And how do we move on? Separating hard facts from hysterical headlines, Sayeeda Warsi brings integrity, intelligence and deep understanding of the challenges confronting Muslim communities, offering hope amid the gloom in this thought provoking lecture. This is a free event, book your place here.